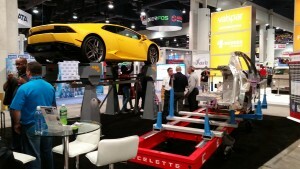 SEMA has warned exhibitors the deadline to guarantee a booth at SEMA and have a chance to pick their position on the show floors is Friday, April 1. There are other perks as well, according to SEMA. Exhibitors with a sweet new gadget for the automotive aftermarket will also get space for one item in the New Products Showcase. Decided after all that you want a booth? Sign up at www.SEMAShow.com/buyabooth. Also, check out RDN’s coverage of SEMA vendor information before last year’s show. Some of it might be applicable before the 2016 show as well. Meanwhile, despite the shrinking number of auto body shops nationwide, the NORTHEAST show is flying high — a heartening sign for the industry. AASP/NJ might even spread the 2017 show, which drew more than 5,000 people, to the second floor of the Meadowlands Exposition Center. AASP/NJ’s news release quotes numerous happy national and regional exhibitors as well. RW Mallon Auto Paint & Equipment business development manager Keith Egan projected his company would rack up six figures worth of business after NORTHEAST. “Our phones have been ringing off the hook every day since we got back,” Egan said in a statement.